← Why is Trump spending so much time MIGA? Did the CIA murder Senator John Tower? Did the CIA murder Senator John Tower? by Wayne Madsen ReportAlthough they were both Republican politicians from Texas, Senator John Tower and President George H. W. Bush became bitter rivals. Documents discovered in the Central Intelligence Agency’s archives point to Bush and his allies within the CIA being upset with Tower over his findings as the chairman of the Tower Commission, named to investigate the culprits behind the Iran-contra scandal. The information gleaned by Tower may have also resulted in his and his daughter’s 1991 death in an airplane crash in Georgia. 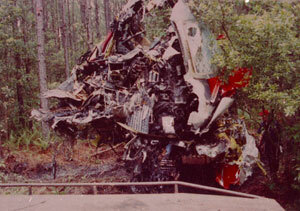 On April 5, 1991, Tower and his daughter Marian, along with 21 others, died in the crash of Atlantic Southeast Airlines flight 2311 while it approached the Brunswick, Georgia airport. The crash was blamed on aircraft equipment failure. Tower and his daughter, who had just cooperated in the publishing of Tower’s memoir, were collaborating on a second “tell-all” book about Iran-contra that was reportedly going to “name names” and Bush’s name would have been prominently mentioned. Any further investigations of Bush and Iran-contra went down in flames on April 5, 1991 with Atlantic Southeast 2311 [left] and the plane that crashed the day before in Lower Merion Township, Pennsylvania [right]. It was this policy of encouraging Islamist radicalization that ultimately led to the creation of Al Qaeda and the Islamic State. Fuller’s daughter was married to Ruslan Tsarnaev, the uncle of accused Boston Marathon bombers Tamerlan and Dzhokhar Tsarnaev. As previously reported by WMR, Fuller, throughout the 1980s, Fuller was front and center during many of the acts of violence in the Middle East, North Africa, and South Asia, from Lebanon and Syria to Iran, Libya, and Algeria, as well as Iraq, Afghanistan, and South Yemen. Among Fuller’s fellow CIA provocateurs trying to stir up Muslims against the Russians was John Brennan, the current CIA director who continues the policy with CIA support of jihadist groups in Syria. As a result of the Tower report, one of the first heads to roll at the CIA was Fuller, who resigned after the report’s release in 1987. Bush and his sycophants at the CIA were livid over not only what Tower released in the report but also what he failed to include but knew about: that Bush was the central kingpin in the arms-for-hostages deal with Iran and the use of the profits to aid the contras. Bush swore out a vendetta against Tower, one that would culminate with a fiery plane crash in Georgia in 1991. Bush tried to escape blame by prodding a dementia-afflicted Reagan to fire White House chief of staff Donald Regan. Bush saw to it that Regan was blamed for the Iran-contra debacle. However, unlike Tower and his daughter, Regan did escape Bush’s wrath with his life. Not so lucky was Pennsylvania Senator John Heinz III, a member of the Senate Select Committee on Intelligence that investigated Iran-contra and one of Tower’s supporters in the confirmation vote for Secretary of Defense. On April 4, 1991, the day before Tower died in the plane crash in Georgia, Heinz was killed in a freakish mid-air crash of his plane with a helicopter outside of Philadelphia.